This article is about the 2000 novel. For other uses, see Stormbreaker (disambiguation). Stormbreaker is a young adult action-adventure book written by British author Anthony Horowitz, and is the first novel in the Alex Rider series. The book was released in the United Kingdom on 4 September 2000, and in United States release on 21 May 2001, where it became a New York Times Bestseller. Since its release, the book has sold more than nine million copies worldwide, been listed on the BBC's The Big Read, and in 2005 received a California Young Reader Medal. The book's plot revolves around Alex Rider being secretly recruited into MI6 to investigate the Stormbreaker computer factory and stop a terrorist attack that will kill hundreds of thousands of British school children. A film adaptation, starring Alex Pettyfer as Alex Rider, was released in 2006. The book begins with Alex Rider learning that his uncle and guardian, Ian Rider, has been killed in a car crash. Unknown to Alex and his housekeeper, Jack Starbright, Ian's job as a banker was actually a cover for his role as an MI6 agent. Alex becomes suspicious upon being told that Ian had not been wearing his seat belt and discovering that Ian's office has been emptied out. He finds his uncle's car at a wrecking yard, and discovers that his uncle had been murdered, being shot several times. After a near escape from a car crusher, Alex is asked to visit Ian's former employers, ostensibly a bank called "The Royal & General". He breaks into Ian's office at the bank, discovering evidence of his uncle's double life before he is knocked out by a drugged dart. After waking up, Alex meets MI6 head Alan Blunt and his deputy, Mrs Tulip Jones. They reveal the truth about his uncle's job, and explain that they had sent Ian to investigate Herod Sayle, a wealthy Lebanese (Egyptian in American adaptations) businessman who has developed a revolutionary new computer, the Stormbreaker. Sayle plans to give a free Stormbreaker to every secondary school in the United Kingdom, accompanied by a grand activation ceremony in the Science Museum, supposedly as a gesture of thanks for the country taking him in when he was a child, after a wealthy American couple sent him to England after he saved their lives in Olive Street. In his last communication with them, Ian had warned MI6 that the Stormbreakers could not be allowed to leave Sayle's manufacturing plant, but before he could explain, he was assassinated by Yassen Gregorovich, a professional killer supposedly working for Sayle, on the return to London. Intending to use him to covertly investigate Sayle, MI6 recruits Alex by essentially blackmailing him; if he does not co-operate, Jack will be deported back to America, his house will be sold and he will leave his school and friends for an institute until he is of age. They put him through a gruelling eleven-day long stint at an SAS training camp (which MI6 also uses), before deploying him to Herod Sayle's base in Cornwall, using the alias of another boy, Felix Lester, who won a competition to visit the plant and be the first child to use a Stormbreaker. To aid him in his mission, Alex is given a grappling hook disguised as a yo-yo, acne cream capable of dissolving metal, and a Nintendo Gameboy which functions as a transmitter, smoke screen, surveillance camera and microphone and bug detector, by MI6 agent Smithers. Sayle shows Alex around his mock-Victorian mansion, which houses a large jellyfish aquarium containing a giant Portuguese Man o' War, located in his office. Alex also meets Mr. Grin, a butler and henchman whose name derives from his time as a circus performer, catching knives with his teeth. An accident in his hometown left him without a tongue and two large scars, which give him the appearance of constant smiling. Initially the trip goes well, with Alex finding a cryptic diagram made by his Uncle Ian in the canopy of his four-poster bed. However, Sayle grows to dislike Alex, firstly after Alex is discovered in a restricted area of the base, and later when Alex defeats Sayle in a game of snooker. While investigating the base at night, Alex sees several of Sayle's agents unloading metal cases with great care from a Chinese nuclear submarine at the local port, with Yassen supervising. When one of the agents drops a metal case, he is promptly shot dead by Yassen. The next afternoon, Alex decides to visit Port Tallon, the nearby village, but finds himself attacked by a pair of armed guards on quad bikes. He survives by tricking the guards into crashing: one collides with an electric fence while the other falls from a cliff face. While searching the library, Alex finds a map in a book about tin mining which matches the diagram left by Ian, discovering that Sayle's land once belonged to Sir Rupert Dozmary, a tin-mining magnate. He also learns that Ian had borrowed several books about viruses, and assumes that Sayle plans to use the Stormbreaker network to release a computer virus into Britain's computer infrastructure. Alex investigates the Dozmary mine and, following the path left by his uncle, discovers a large computer manufacturing facility, where the Stormbreaker computers are being filled with a strange fluid. Alex realises that the 'viruses' being investigated by Ian were not computer viruses, but biological weapons. Alex is detected, and nearly escapes but is eventually caught and tranquilised. When he comes to, Sayle explains to Alex his plan. When Sayle attended school, he was bullied because of his accent and skin colour. The worst bully was none other than the future Prime Minister, leading him to despise English children, and all of Britain in general. As a result, Sayle plans to take revenge on the Prime Minister and Britain with his "April Fools Joke"; when the computers are activated by the Prime Minister, the virus, a potent, nearly unstoppable strain of smallpox, will be released into every school in the country, killing every schoolchild and teacher in England as well as those in Scotland, Wales and Northern Ireland. Alex is then left handcuffed to a chair, until Nadia Vole, an assistant of Sayle's, frees him, claiming that she is a fellow spy who worked with Ian Rider. However, as they head to find a mobile phone to call MI6 and inform them of Sayle's plan, she triggers a trapdoor which drops Alex into the jellyfish tank and stays behind to watch him die. Alex eventually gets free by using the acne cream gadget to damage the tank's supporting iron girders, causing it to rupture and sending thousands of gallons of water crashing into the room. Unfortunately for Vole, she was directly in front of the tank when it burst, releasing the immense jellyfish and causing it to land right on her, killing her painfully and instantly. Snatching up a harpoon gun, Alex rushes outside to find that Sayle's private helicopter has already left, leaving only a cargo plane on the tarmac. Using the handle of the harpoon gun, Alex knocks out a guard, taking his jeep and pistol. As he starts the jeep, several other jeeps start to pursue him as the cargo plane starts to take off. Through some fancy driving and good fortune, Alex manages to cause the destruction of the hostile jeeps. Tying the nylon cord of the yo-yo gadget to the harpoon with the yo-yo clipped to his belt, Alex shoots the harpoon which catches on the underbelly of the airborne plane. Using the gadget, he gets himself on to the plane where he confronts the pilot, who is none other than Mr. Grin. Alex instructs Mr. Grin to fly to London by threatening him with the pistol. When they are finally over London, Alex realises that there is not much time left before noon. He spots several parachutes and uses one to jump off the plane. Mr. Grin turns the plane around hoping to ram into Alex. Alex pulls out the Game Boy Color and activates a cartridge disguised as a game called "Bomber Boy", which activates a smoke bomb that he left on the plane. Unable to see, Mr. Grin loses control of the plane and fatally crashes into a dock near the River Thames. Alex crashes through the roof of the Science Museum and dangles from his parachute which had gotten caught on a beam. Alex draws the gun he took from a guard back at Sayle's mansion and fires blindly at the Stormbreaker computer, one accidentally hitting the Prime Minister and Sayle himself being struck by two more, though he inexplicably vanishes. Mrs. Jones saves Alex's life by ordering security not to open fire on him. MI6 immediately recalls all the computers, citing "safety issues". Later, after a debriefing by Alan Blunt and Mrs. Jones, Alex enters a taxi. The driver is in fact Sayle who holds Alex at gunpoint. He leads Alex to the top of a building where he is about to shoot Alex, but is himself shot by Yassen Gregorovich, who lands in a helicopter. When Alex questions Yassen about why he shot Sayle, Yassen explains that Sayle had "become an embarrassment to the people he (Yassen) works for", so he had to be eliminated. Knowing that he is facing his uncle's killer, Alex tells Yassen he will one day kill him, but Yassen brushes aside the comment and tells Alex to drop the spy business and become a normal schoolboy again, before leaving in the helicopter. Critical reception for Stormbreaker was mixed to positive, with the book being placed on multiple ALA lists. Commonsensemedia praised Stormbreaker for its action sequences, but criticised its dialogue and logic. Kirkus Reviews also commented that the book's plot was "preposterous" but stated that the readers "won't care". In 2005 a graphic novel adaptation of Stormbreaker was released in the United Kingdom and the United States. The graphic novel was an adaptation of the screenplay written for the movie released the same year, and was intended as a tie-in for the film. In 2006 a film adaptation of Stormbreaker was released to theatres starring Alex Pettyfer as Alex Rider and Geoffrey Sax directing. Critical reception for the film was average, with Stormbreaker holding only a 33% approval rating on Rotten Tomatoes with the consensus being that the film was "strictly children's fare, as it lacks originality, excitement, and believabiltity". A video game adaptation of the film was released in 2006 under the name of Alex Rider: Stormbreaker for the Game Boy Advance and Nintendo DS. The game received mixed reviews, with IGN criticising the game and giving it a rating of 4/10. ^ "New York Times Bestsellers" (PDF). Archived from the original (PDF) on 6 October 2008. Retrieved 11 July 2008. ^ "California Young Reader Medal". ^ "Review: Stormbreaker". Publishers Weekly. Retrieved 22 January 2013. ^ a b c d e f g "Top Teen Titles #35–39". School Library Journal. Retrieved 22 January 2013. 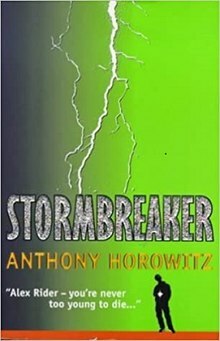 ^ "Stormbreaker (Alex Rider Adventures, Book 1) by Anthony Horowitz – Book Review". ^ "Review: Hi Stormbreaker". Kirkus Reviews. Retrieved 22 January 2013. ^ "Stormbreaker filming finishes". BBC News. 14 August 2005. Retrieved 22 May 2007. ^ "Alex Rider: Operation Stormbreaker". Rotten Tomatoes. Retrieved 9 July 2008. ^ "DS Gets 'Stormbreaker' Movie Product Placement". Gamasutra. Retrieved 22 January 2013. ^ "Review: Alex Rider: Stormbreaker". IGN. Retrieved 22 January 2013.